Many Nintendo fans remember the Punch-Out franchise fondly. The rudimentary exploration of boxing's sweet science challenged players to find the best strategy against each opponent and capitalize upon weaknesses to rise up the ranks and eventually claim the championship. Arms explores similar mechanics while pushing the concept far into the realm of the absurd in a way that is exciting, challenging, and fun. 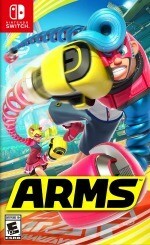 The core Arms experience pits two fighters with extendable arms and super-powered fists up against one another in one-on-one battles. Punches constantly fly, items fall, and tensions rise as the battle goes on. 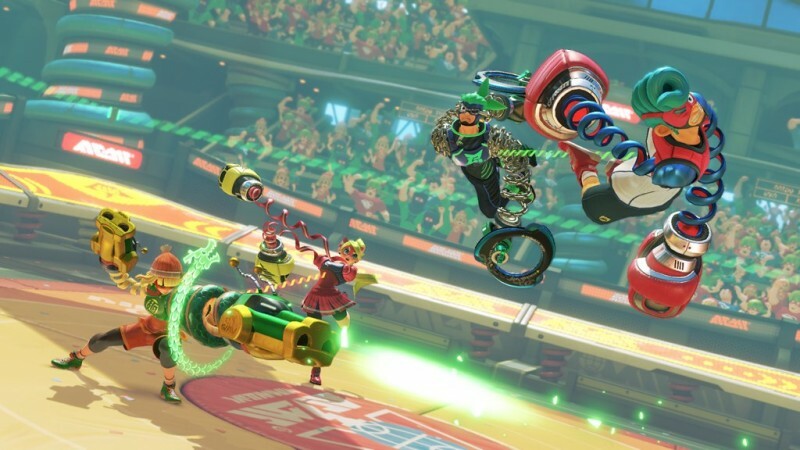 The action in Arms is constant, even when the players are feeling each other out or learning the controls. If you're not throwing a punch, chances are you're dodging one or dashing around the arena to find the right distance and angle. Despite this breakneck pace and accessible controls, Arms is far more than a shallow experience. Facing off in Arms is more strategic than the basic concept would have you believe. Standard fights typically come down staying mobile as fists fly your way, then counterpunching before your opponent can duck out of the way. Planning how you use the field also comes into play, as each arena presents different elements to take advantage of. Do you use the glass tubes in DNA Lab as cover, or do you smash straight through them? Do you keep your high-ground advantage on the stairs at Ninja College, or do you take the fight to your opponent? 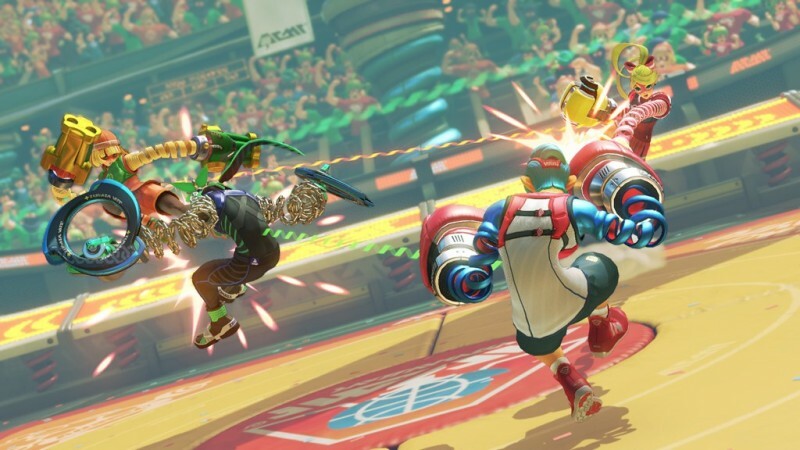 Arms deftly blends these factors into quick, arcade-style matches - and you need to gain a base familiarity with all of them before you're going to have a chance against competent enemies. If you try to take on a difficulty level you're not ready for, the steep learning curve only leads to frustration. An added layer of strategy comes into play before the match, as you not only choose your character, but also which arm loadout you want. If you choose a smaller character, such as the speedy Ninjara, but your opponent selects the bulky tank Master Mummy, you can either try to level the playing field by selecting heftier arms with slower, more powerful attacks, or double-down on the speed advantage by opting for lighter arms. Because of how strategic battles are, being precise and intentional with every move is important. 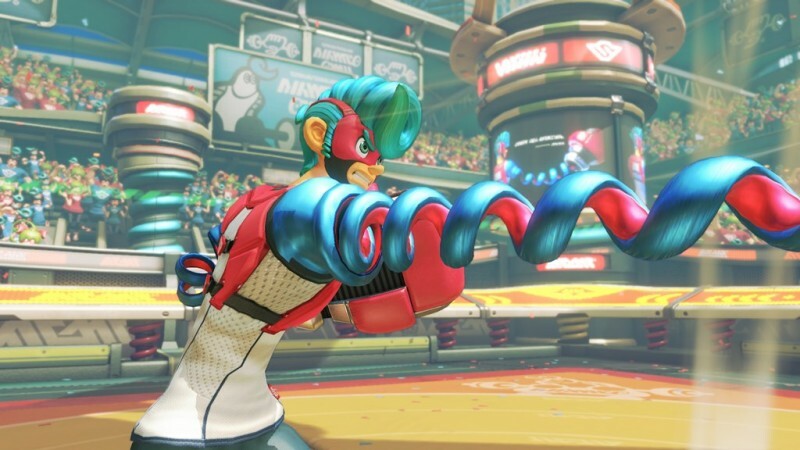 Arms' motion controls feel good; I love throwing a right hook in real life and seeing it play out as a curved right-arm punch in-game. Unfortunately, the default motion controls fail to provide the level of exactness I needed to be competitive in more difficult battles. Once I switched to the traditional scheme that uses buttons instead of motion controls, I felt much more accurate in my movement and attacks, though I wish I could remap the buttons. 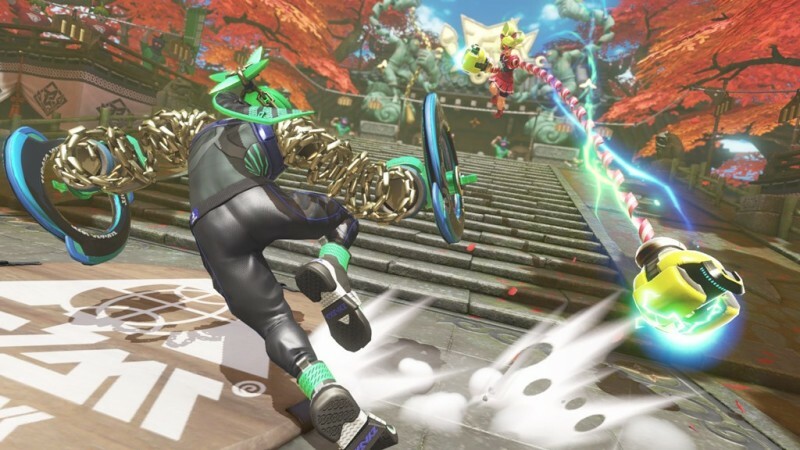 Outside of the standard fighting modes, Arms features several unique minigames. V-Ball (Arms' oddball take on beach volleyball) and Skillshot (competitive target-smashing) are a blast with friends, but no mode is better silly fun than Hoops, where you attempt to slam or hurl your opponent into a basketball hoop. These minigames are integrated into the Grand Prix arcade-style offering, local versus, and the online party modes, but they can also be played standalone. While they are far from the main attraction of Arms, I loved whenever they popped up, because they are an entertaining break in the tense action of hand-to-hand combat. Sadly, these minigames are often over in quick order, and the rule/timer customization of the fighting modes is largely absent; I would love the ability to make Hoops matches last longer. 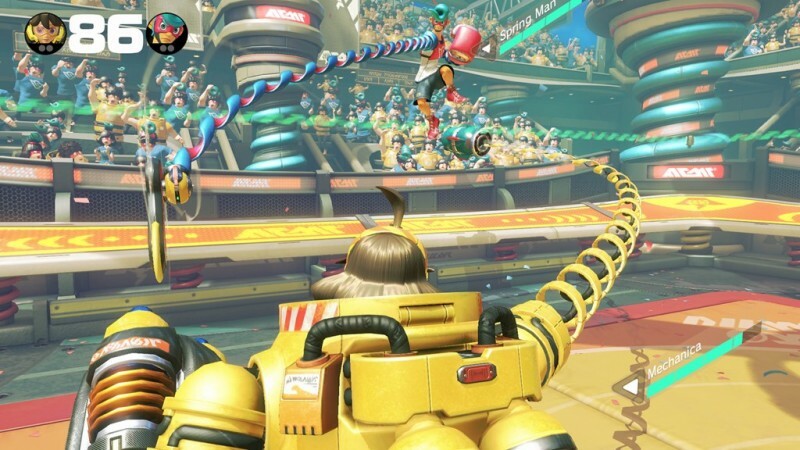 Also, while I enjoy what Arms offers in way of these side competitions, I wanted more of these silly, quick-hit minigames, since the basic offerings feel a little thin. The Grand Prix mode provides a ladder-style tournament similar to what is seen in other arcade modes, but I missed the unique and meaningful nature of a proper story mode. Grand Prix, while challenging, doesn't serve as a strong enough destination mode for when your only option is single-player. While my favorite Arms experiences came from laughing alongside my friends in local multiplayer, Arms delivers a capable online suite. You can play online against friends or try and level up in ranked matches, but nothing compares to the excitement of party match. In party match, you enter a lobby with other players and match up in everything from four-player free-for-all fights to the various minigames to a co-op boss battle, all while the game keeps track of score across all players. Ranked battles let you earn different player titles, giving you motivation to continue playing over time. No matter what mode you gravitate toward, you obtain in-game coins, which let you play a bonus game to earn new arms. As you play the Get Arms target-smash game (which plays like an easier version of Skillshot), giftwrapped presents fall in the distance. If you hit one of these wrapped boxes, you unlock a new arm for one of the characters. I relished in adding new abilities to my favorite characters' arsenals. However, with such extravagant character designs, it feels like a missed opportunity for extending the playability of this loop to not include cosmetic customizations into the mix. Arms is a zany fighter that delivers excitement and fun at every turn. While I wish there was more to do, what is included in the package is worthwhile. If you're looking for a fresh and exciting experience to play on your Switch, Arms is worth a look. 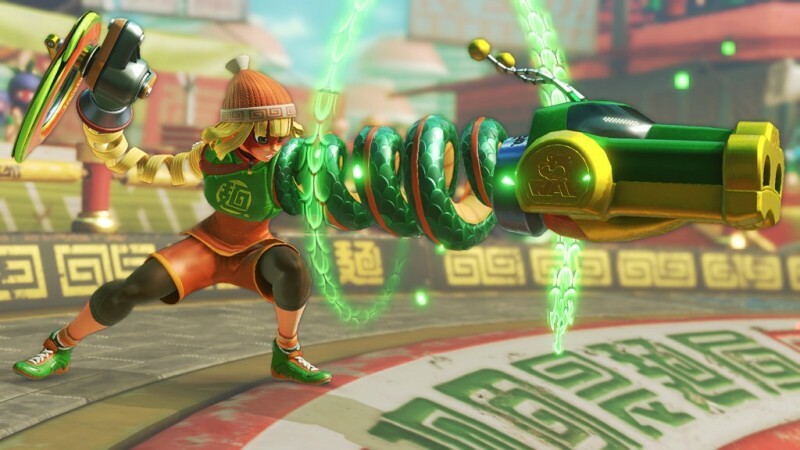 The online portions of Arms were evaluated on pre-release servers. 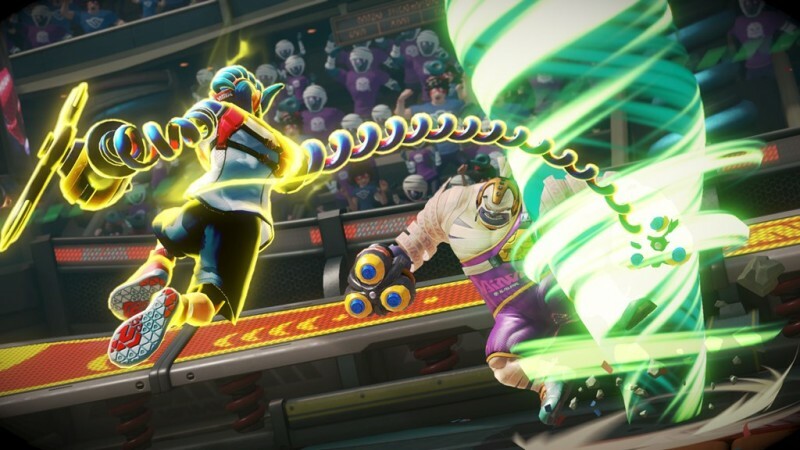 Arms is a fun and unique addition to the growing Switch catalog.